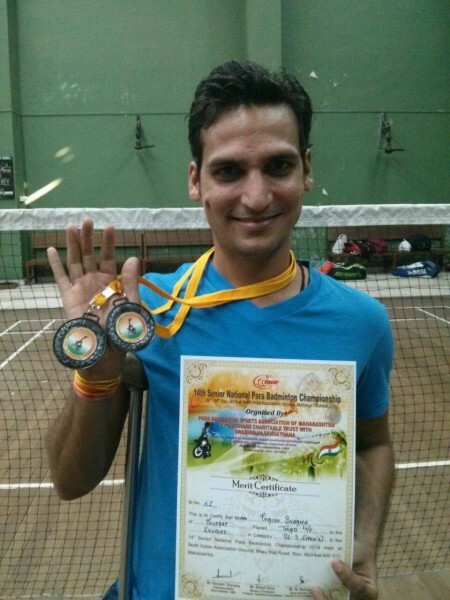 AMF has sponsored GIRISH SHARMA who represent our country in Para-Badminton in V Spanish Para-Badminton International 2015. He is an international performer and won several medals. He won the Gold in the Men’s Singles and Doubles event at the Asian Paralympics Cup in the month of December 2008 held in Bangalore, Karnataka. He stood 2nd in the Men’s Doubles event at the Israel Open Disabled Badminton International Championship in the month of March 2007 held in Jerusalem, Israel. 3rd place in the Men’s Singles event & 2nd place in the Mens Doubles event. Girish will also be training the amputees interested in BADMINTION in future when we conduct camps in future in Hyderabad with AMF.